Homouroboros is a huge, 26 foot tall, 30 foot diameter sculpture that rotates like a carousel creating a life-sized animation. 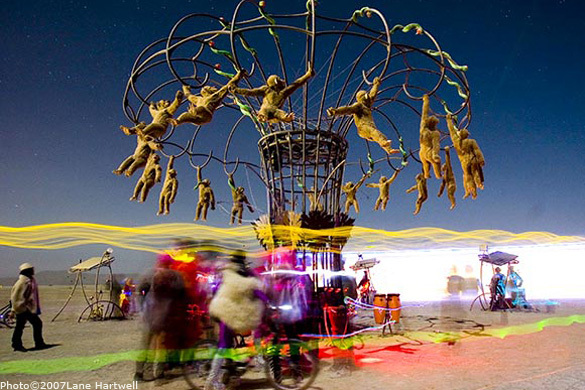 It was one of the most awesome interactive works of art at Burning Man 2007. When operational, it looks like 20 monkeys hanging and swinging from a carousel. Yet, what makes it truly incredible to experience is that when wearing special glasses, it appears as though each monkey is swinging from place to place with serpents that crawl out of each branch to deliver an apple to the next monkey who then eats it. The work of art is mechanical genius – and a delight to view. Let’s take a look at some its technology. Mechanical – The carousel is a made of welded steel and aluminum and is 26 feet tall and 30 feet in diameter. It appears like a rotating tree. When the strobe effects are within synchronization, the tree rotates at 30 times per minute. There is also a rain tower that makes it rain for 30 seconds every half hour of operation. Power – Surrounding the carousel are eight bicycles that generate electricity to drive the carousel. Solar canopies are above the bicycles that generate electricity during the day. A bank of deep cycle batteries, located in the trunk of the tree, stores power for about a day of activity. Strobe effects – What makes this appear so incredible is the strobe effects that light up the monkeys at the precise moment like a frame in a movie. During the day, the bicycles have an LCD screen that is synchronized with the strobe timing so that whoever is powering the bicycle can see the effect. During the night, strobe lights illuminate the moneys at the right moment and all observers can view the strobe effect. Peter Hudson, aka Hudzo, is the brainchild of Homouroboros. He was also the creator of other brilliant strobe-based sculptures such as swimmers diving into the sand. Steve Valdez was in charge of the metal fabrication and Joe Martin in charge of electronics. Yet, there were hundreds of volunteers who helped with every aspect of the building, delivery, and maintenance of the art piece. The work was funded by the Black Rock Arts Foundation[link], a non-profit organization that funds interactive public art.